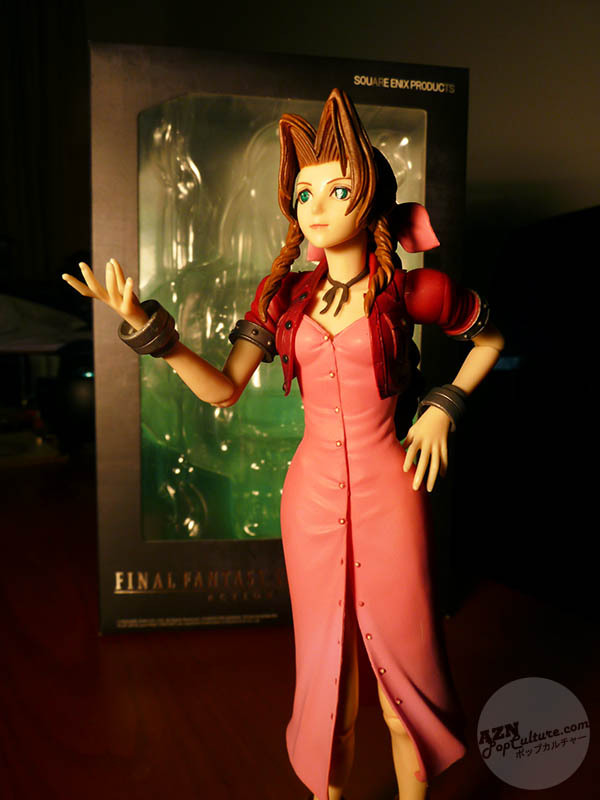 After telling a couple of my friends that I'd started writing this blog, they visited it and after reading a few of the posts, became aware of my new interest in anime and game figures. 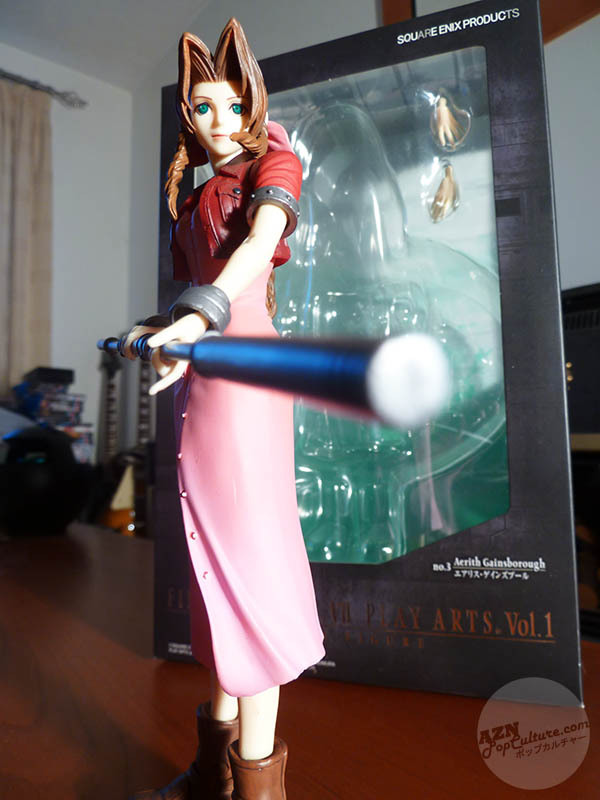 So for my birthday a few months ago, I had a nice surprise, when they clubbed together to get me a birthday gift, and when I opened it, I found this Aerith Gainsborough action figure. 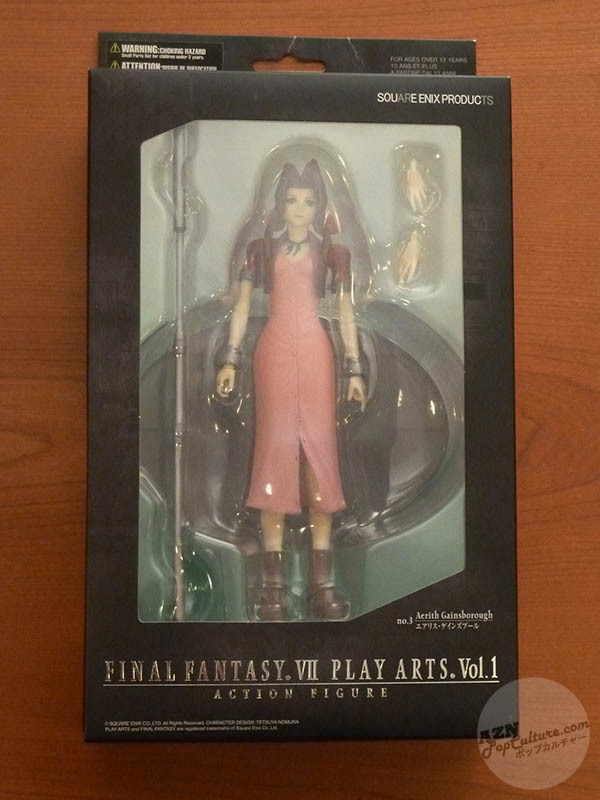 Aerith, along with Tifa Lockhart, was a playable character and one of Cloud Strife's love interests in the first Final Fantasy VII game (in the original game, her name is spelled Aeris; in other FFVII titles such as Crisis Core, Before Crisis, Dirge of Cerberus, Dirge of Cerberous Lost Episode, and the movie Final Fantasy VII: Advent Children it is spelled Aerith). 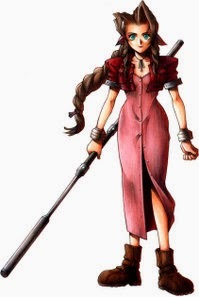 In Final Fantasy VII, she is a 22-year-old woman who joins the eco-terrorist organization AVALANCHE. 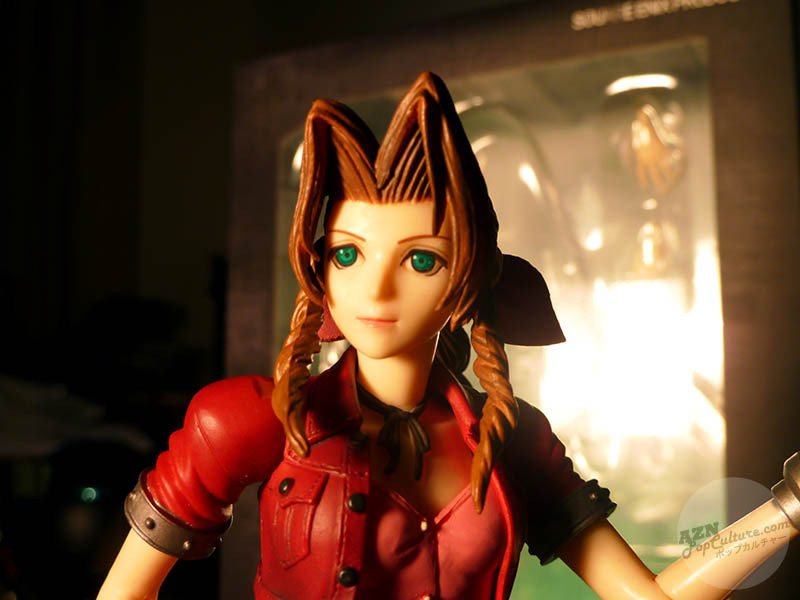 As the story progresses, AVALANCHE begin to pursue the game's antagonist Sephiroth, and the player learns that she is the last surviving Cetra, or "Ancient", one of the planet's oldest races. 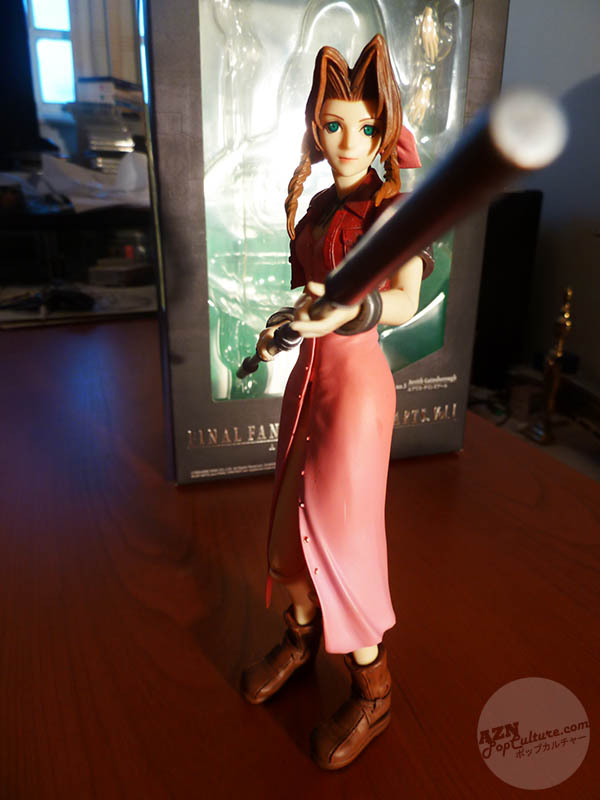 Final Fantasy VII was, for me and many others, the game that got me into the Final Fantasy series, and I've been a fan ever since. None since then, however, have quite been able to capture my imagination quite as much as that particular game. The story was intriguing and the characters engaging; I really felt at the time that I actually cared about them, what might happen to them, and that I wanted to see them through to the conclusion of their adventure. I seem to remember playing well over a hundred hours of that particular entry to the series, sometimes playing all through the night! 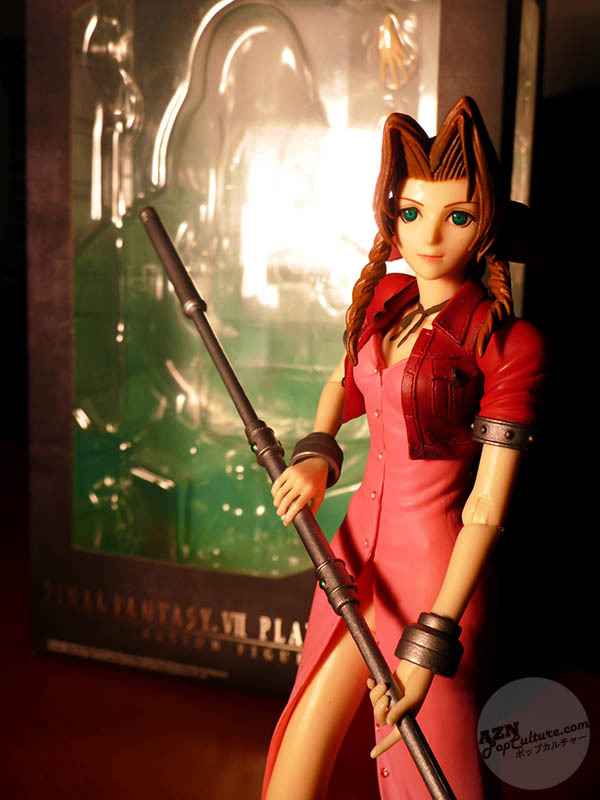 Released in early 2008 (the Japanese version was released in December 2007), this PVC figure comes from Square Enix's Play Arts Kai, manufactured by Kotobukiya, and stands at 185 mm (7¼") tall, excluding the base. 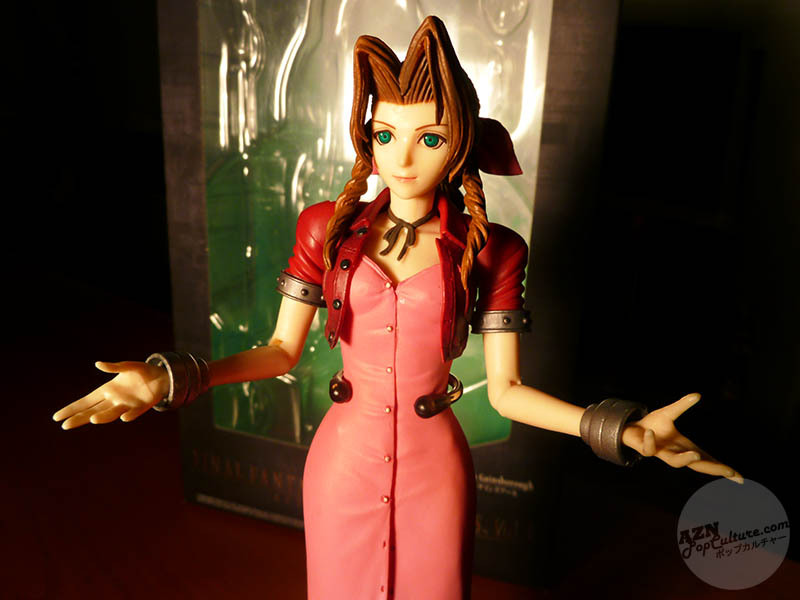 Her hands are interchangeable, and an alternative pair of (open) hands are included in the box, with which you can swap, should you so wish. 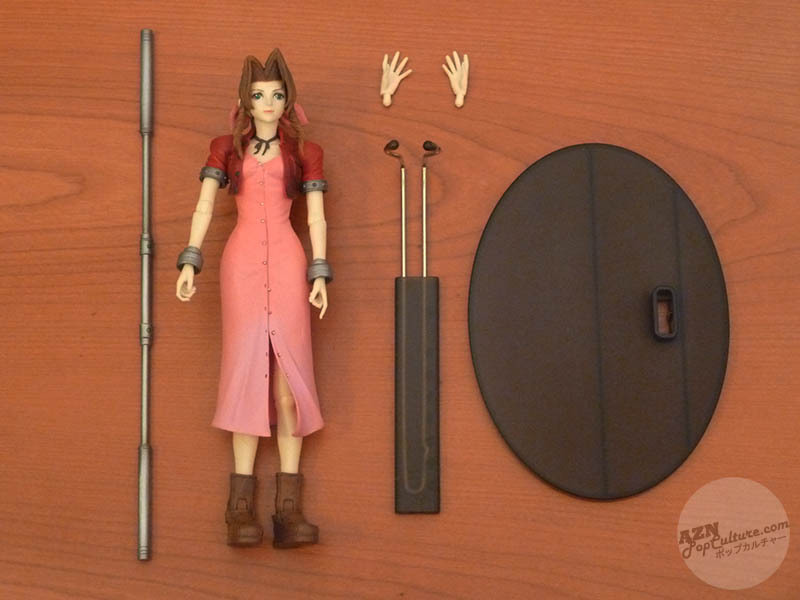 The already attached hands are shaped to grip Aerith's staff, which is also included, along with a base on which to stand her. 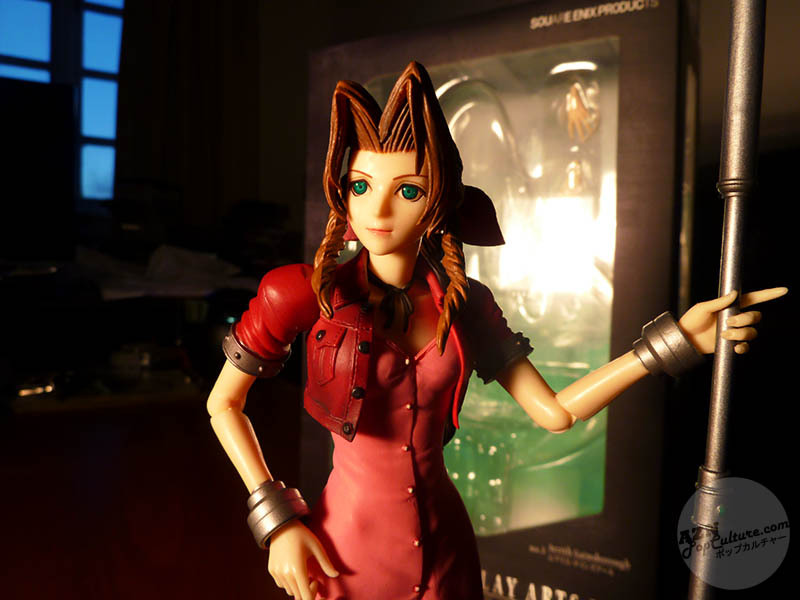 The likeness of the figure, in comparison to the original Nomura Tetsuya concept art is quite good, although her face and body proportions are a little different, resulting in the figure itself looking a bit more realistic and lifelike than the original artwork. 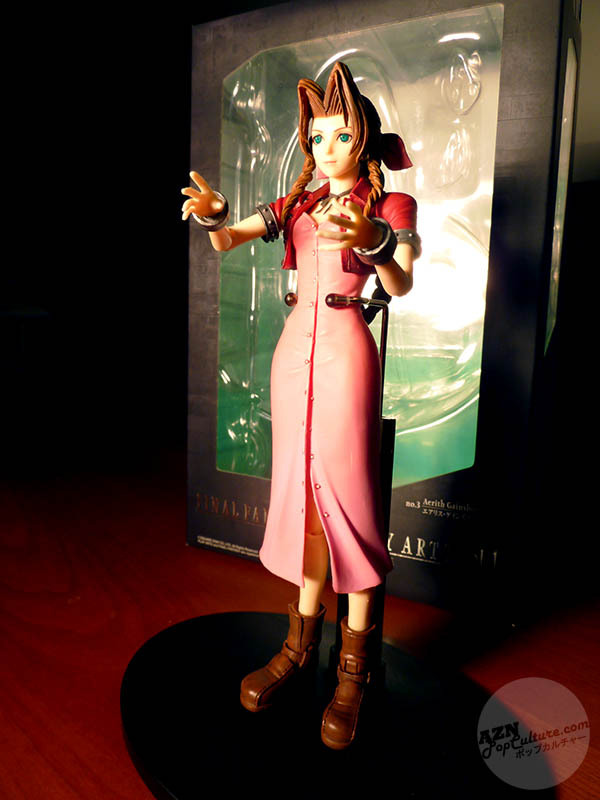 The colours of the figure's paint job are very close to those in the artwork too. 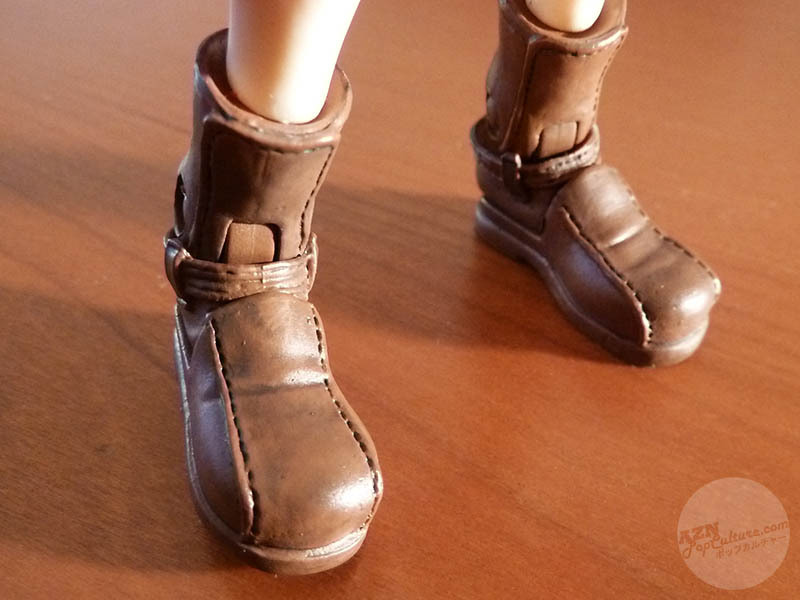 It's a fairly detailed figure, with a lot of nice touches, such as the stitching moulded into her boots, and some subtle creasing down the front of her dress. 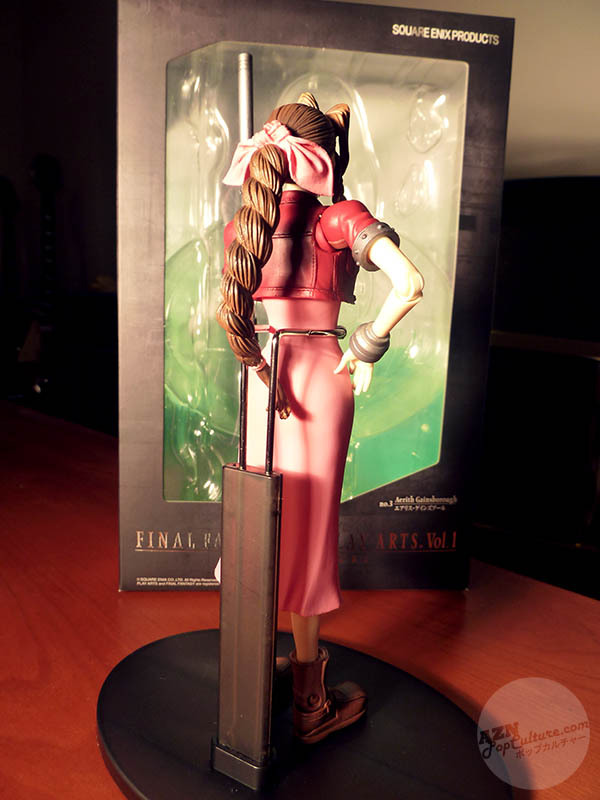 The hair is also quite nicely moulded with a large ponytail down her back. 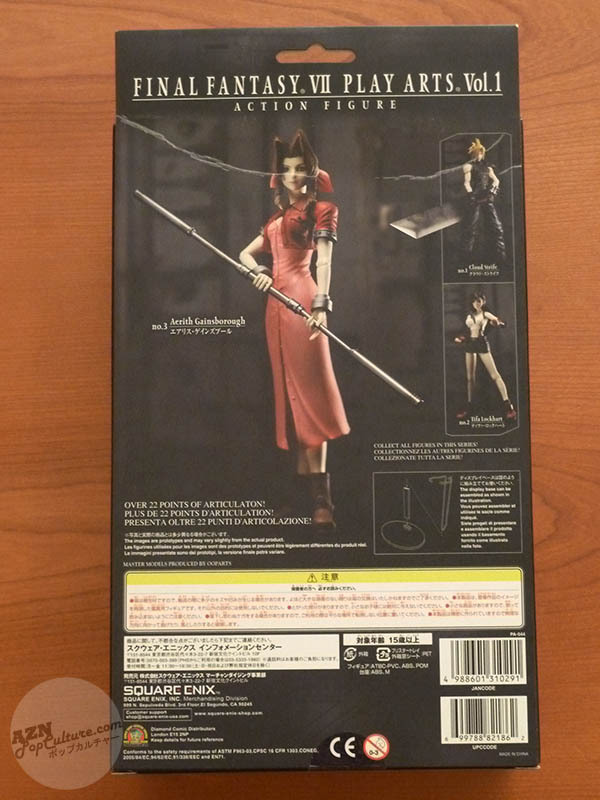 The box in which the figure comes, exclaims that there are "over 22 points of articulation! 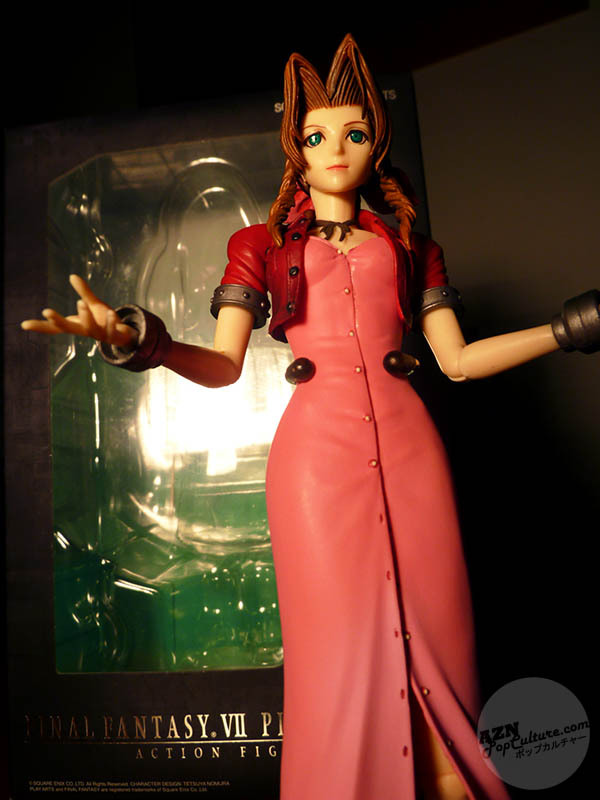 ", and as such, the figure has decent poseability, however, leg movements are a little more limited, as the dress restricts movement of the legs somewhat. 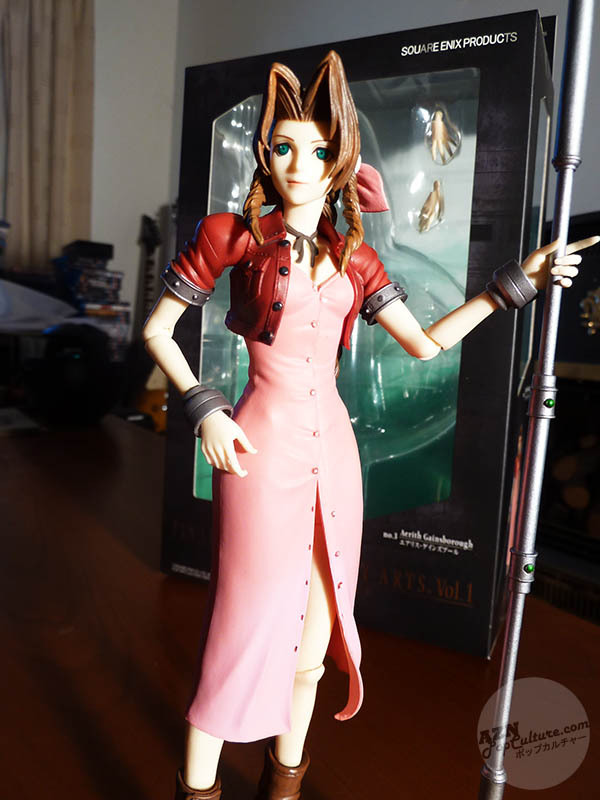 The split down the front of the dress makes this a little easier, so the legs can actually move, but another problem is that the legs can rotate back and forth, but do not rotate outwards, makeing some poses impossible to achieve. On first use, the knee joints were quite stiff compared to the rest of the figure, but after a few poses these have loosened up a little. 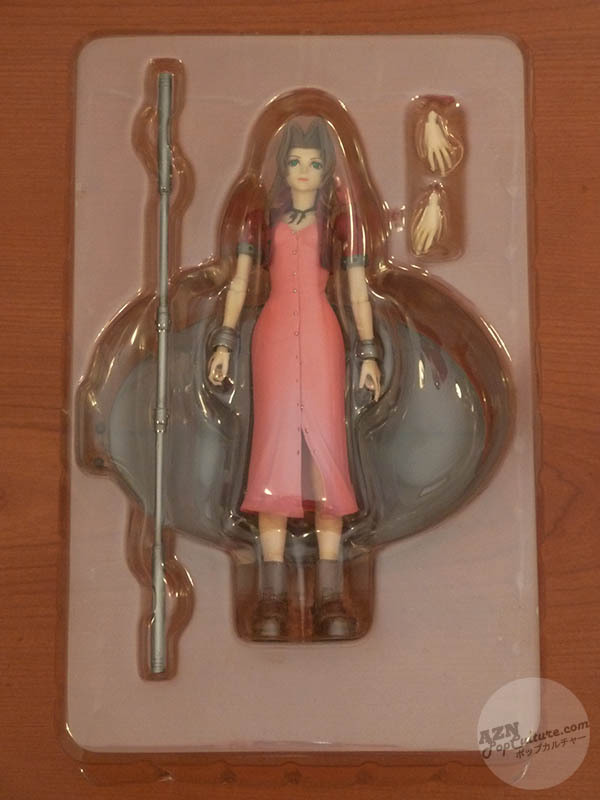 On the box, it does say "Action Figure", but I would say that this isn't really a toy; one would probably just pose the figure, and then put it on display, rather than give it to a child to play with. 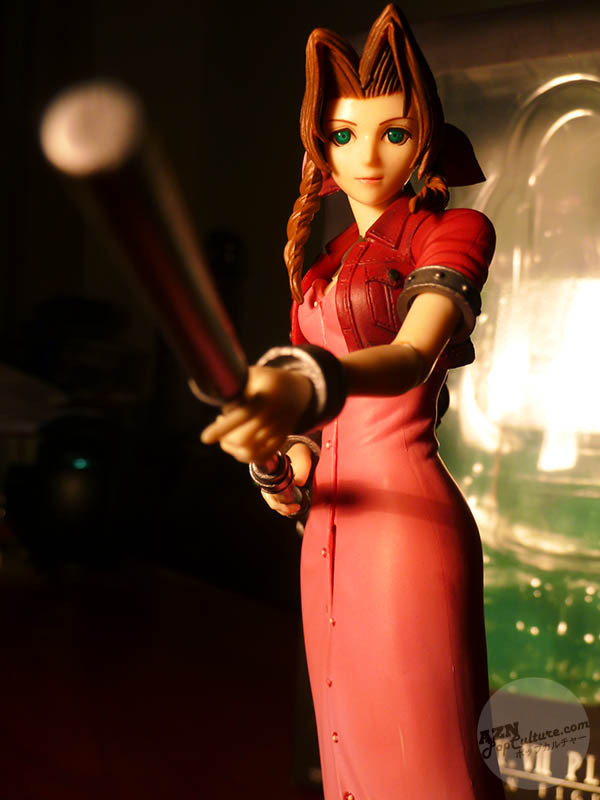 As I said previously, posing the figure can be a little difficult, and also, it can be quite fiddly to get the hands to grip her staff. 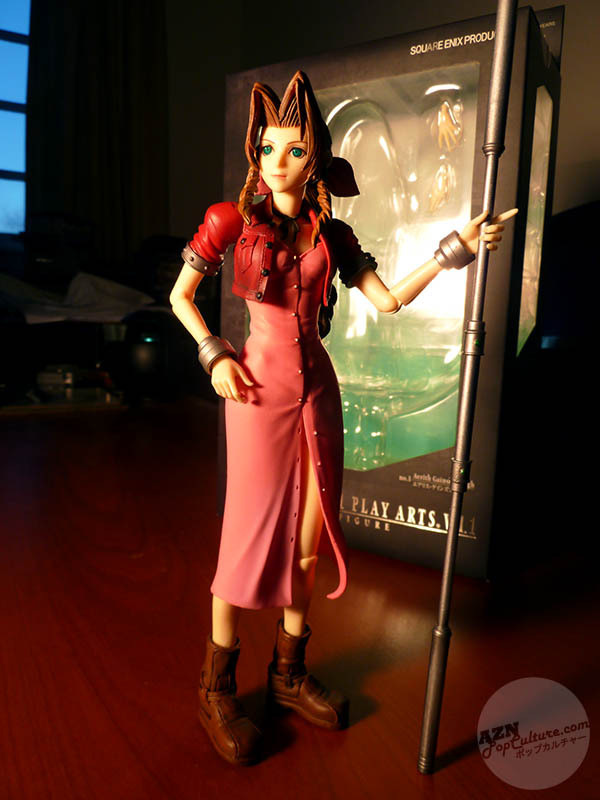 In terms of mould lines, this figure is very good. On close inspection, some can be seen on the arms and legs, but they're barely visible at all. The legs are mostly covered up by her dress, and on the arms, the lines are aren't all that noticeable, unless you look very closely. 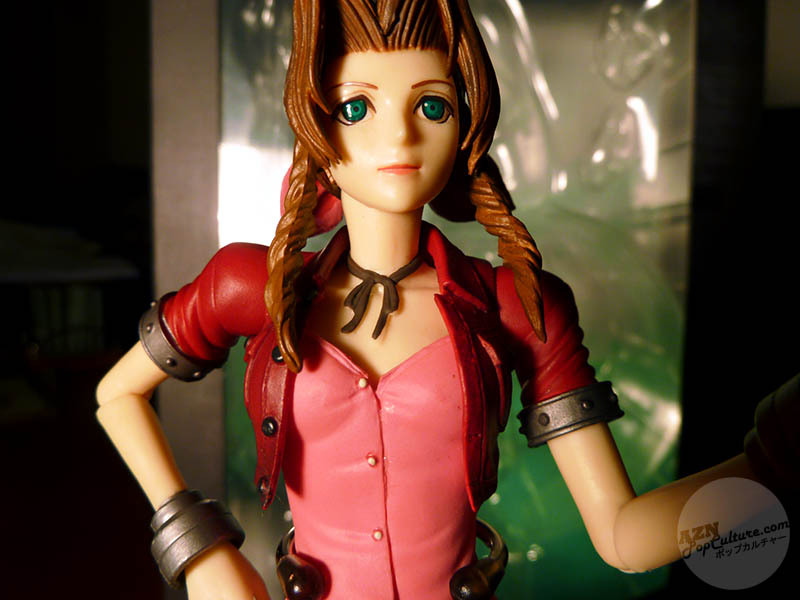 The mould lines that are most visible appear on her hair. The paintwork is good, with nice shading in her jacket and hair, although I would say that her eyes look a little blank and not particularly expressive. 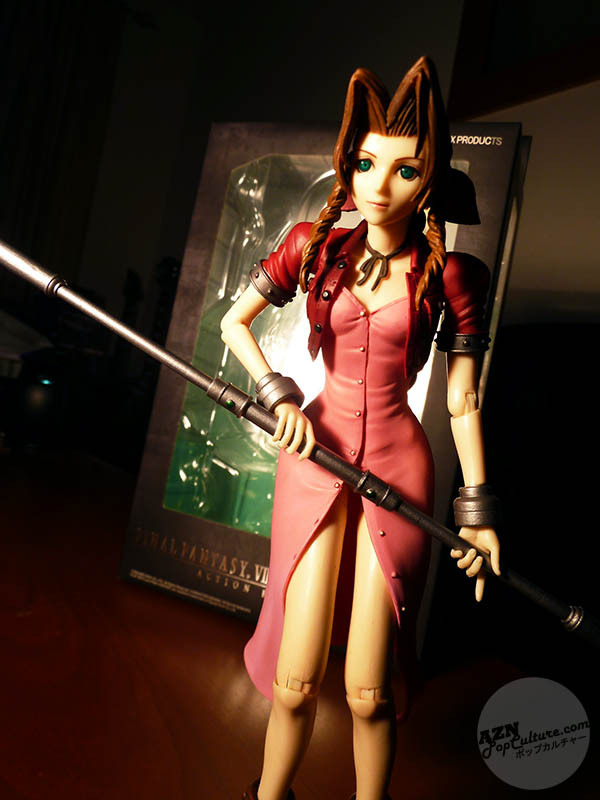 All in all, I'd say this is a great looking figure; nicely detailed, and a good likeness to the character. One negative on this particular piece, however, is that both of her lower legs seem to be left legs. The mould for each calf/shin seems to be the same, bending very slightly one way. 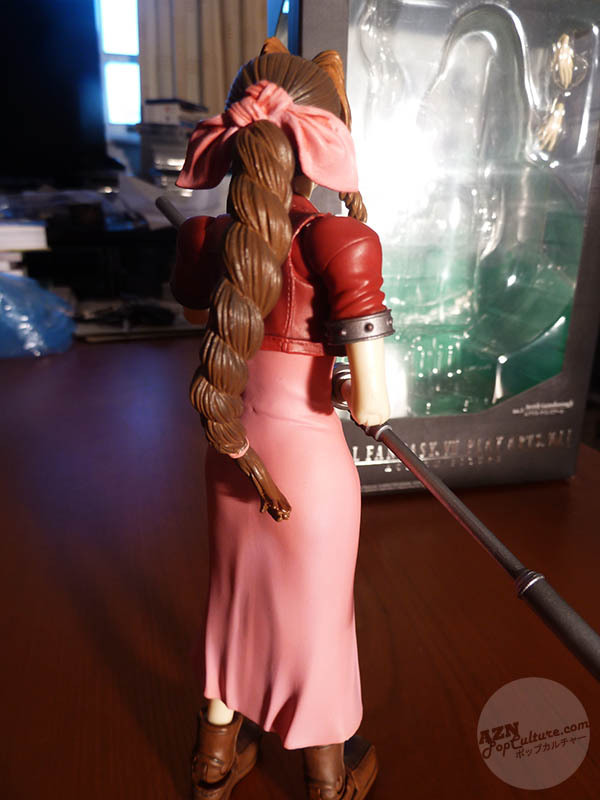 I don't know if this is the same on all of the Aerith figures, or if this is just an isolated case, but it's present on my figure. Again, this isn't really noticeable, except on close inspection, so I'm not worrying about it too much. 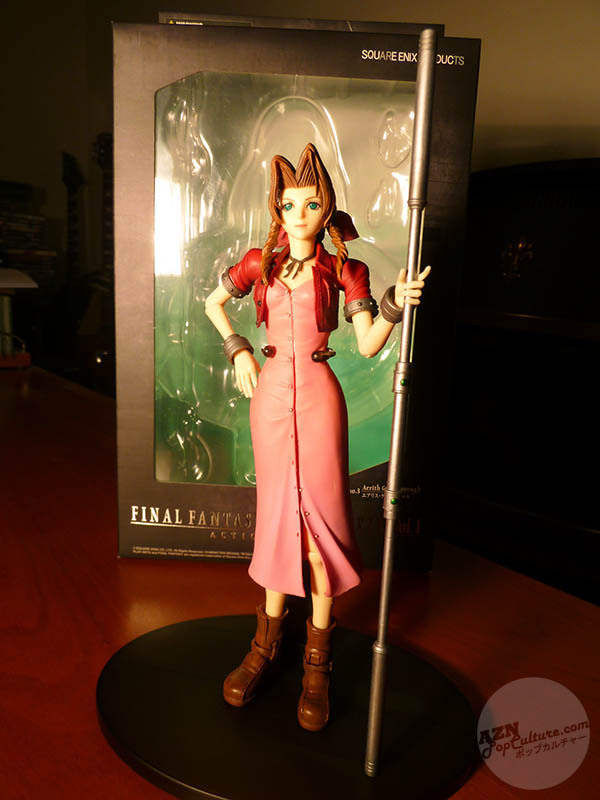 Like I said before, this is a great looking figure, and despite those few flaws, if you are in any way a fan of Final Fantasy VII or the Final Fantasy series, I would definitely recommend this. 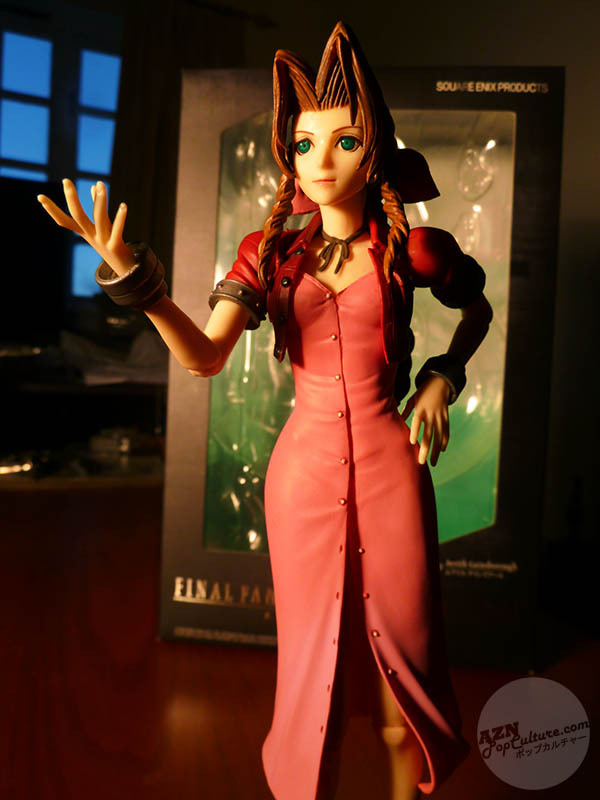 I do believe that Aerith was the literal translation or pronounciation of the name and fans protested or rnemaed the character as such. 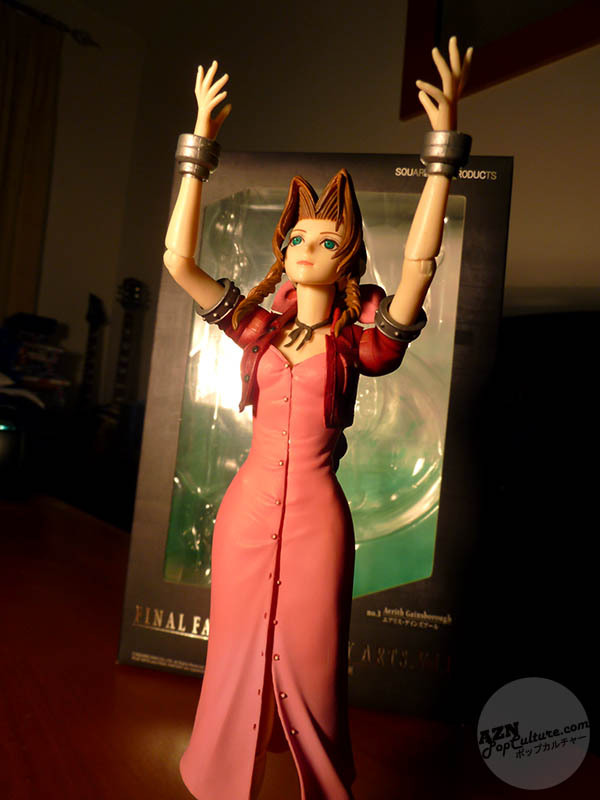 She was also remoured to be revivable later in the game but that was later dropped.. if they did that now they'd probably charge people for DLC. 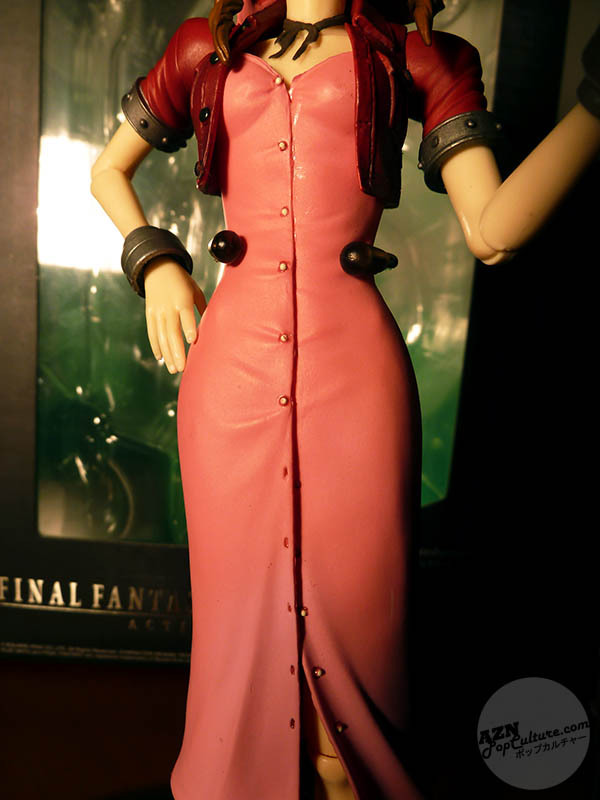 or maybe that would just affect Vincent and Yuffie. 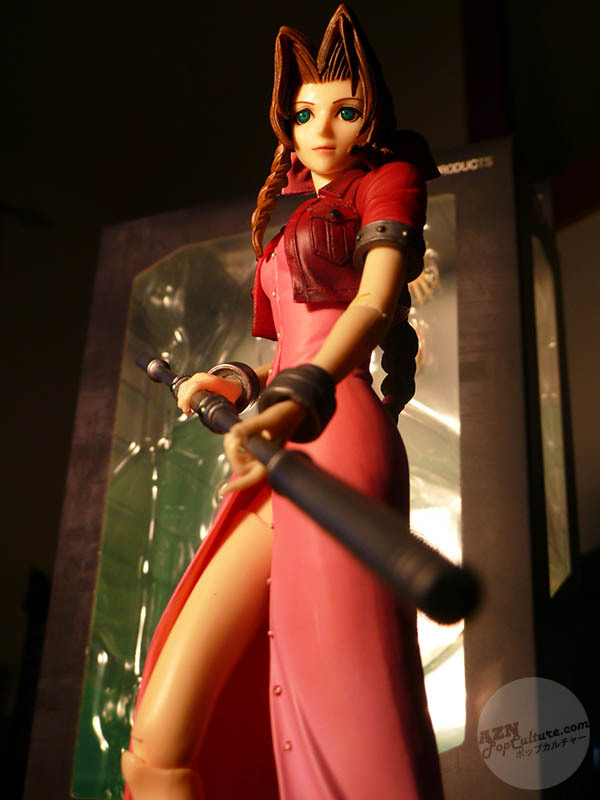 I don't own the Aerith Figure but I do have the play arts Tifa, I do believe there were two variatons, one of the Original costume and the other her black leather ensamble from Advent Children, I own the former. 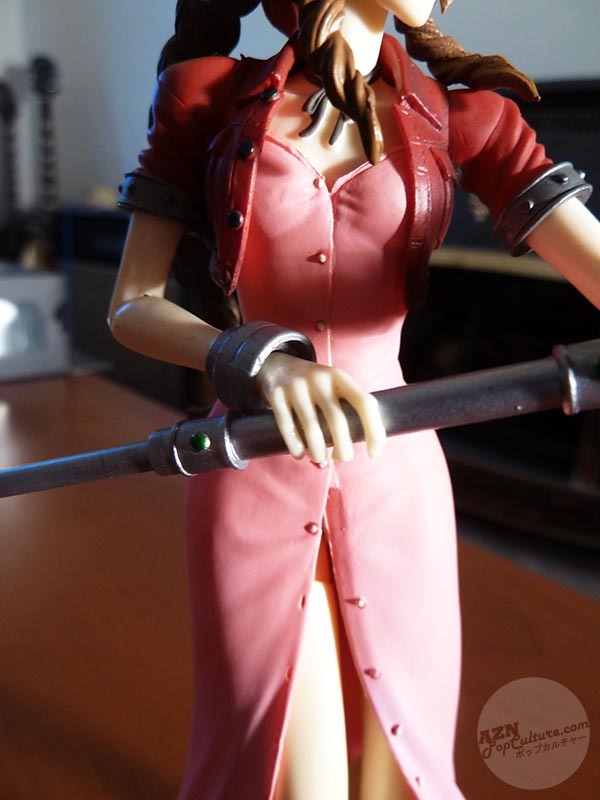 Thankfully she has the correct feet, though Tifa is a brawler in the game so you don't get anything other than the stand and her open and closed changable hands. 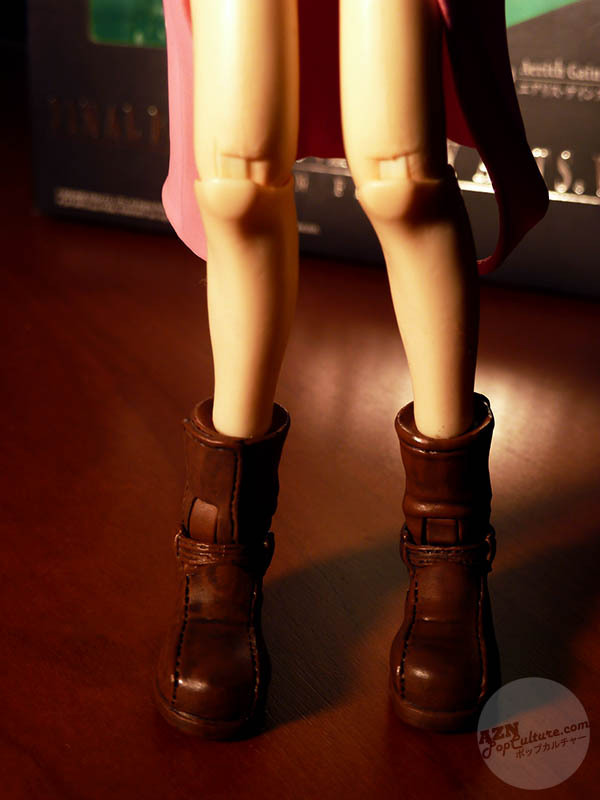 her short skirt also allows a bit more leg freedom though I keep her boxed anyway. The name, if written in the Japanese Katakana, is エアリス. 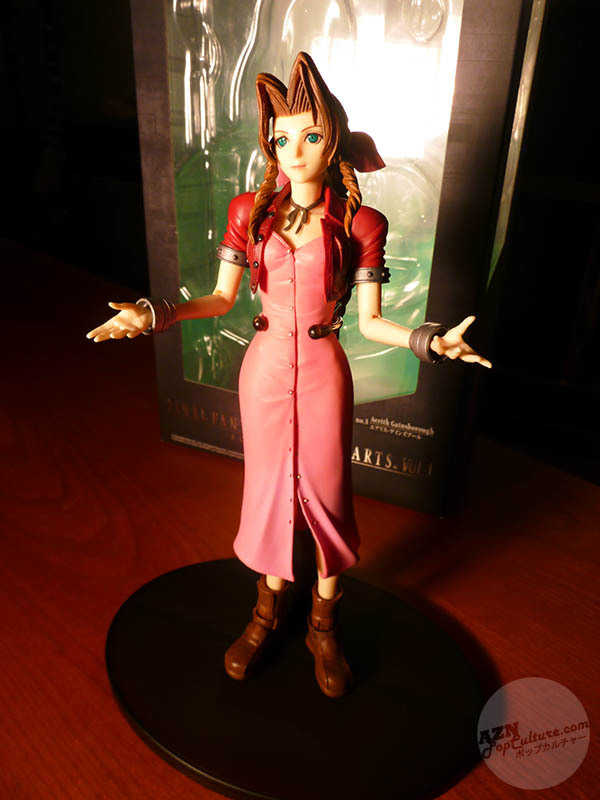 エアリス translates to e-a-ri-su, hence Aeris in the original FFVII game. 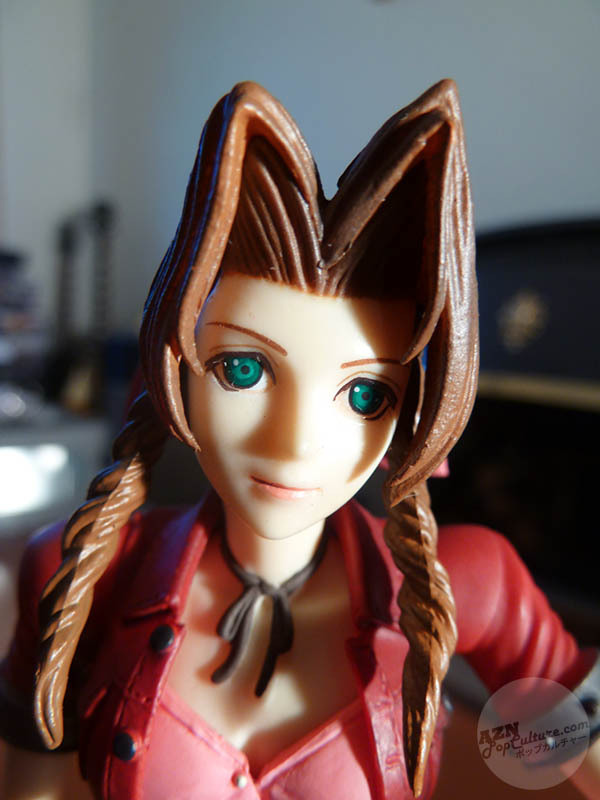 There is no "th" sound in the Japanese language, so when Aerith is written in katakana, it would still end with リス, which kind of approximates the "th" sound. Another example of this could be illustrated with "thank you". In katakana, it would be written as サンキュー, which would be spoken sa-n-kyuu. 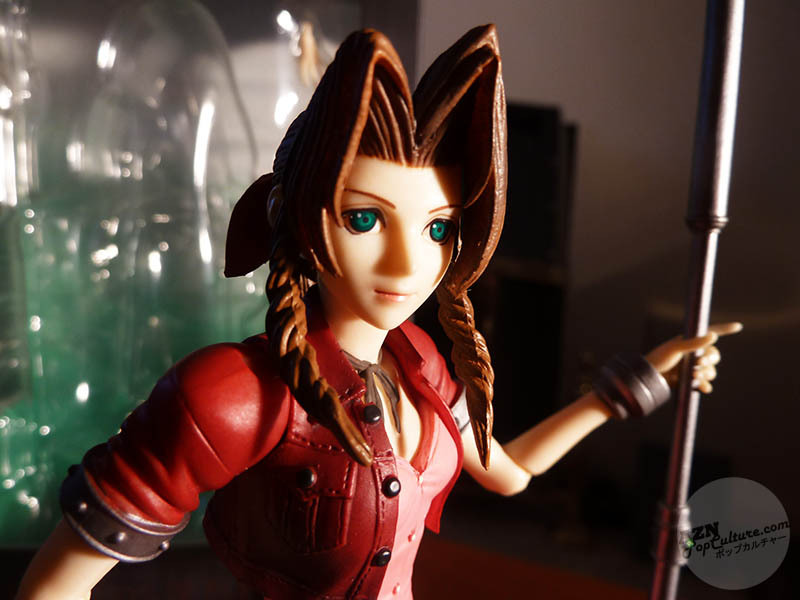 Yes, I had a look at maybe getting the original Tifa figure for a review, as well as Cloud and his bike, but these figures aren't exactly cheap, so decided against it.